GTD: You trained in the GTD XC program this past summer. In past years you trained in the GTD all-sports program. Why the change? 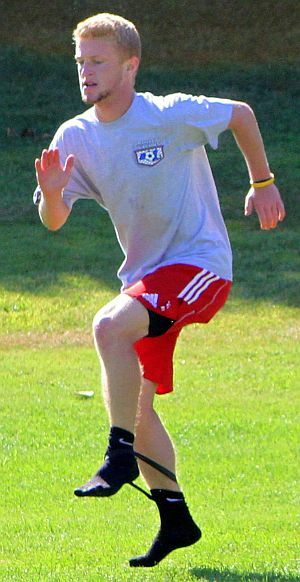 Connor: In years past I was always training to play soccer in the fall which required the need for speed. I was able to get this type of training with the all-sports camp from the work with ladder drills and other quick and rapid speed drills we performed. I switched to the XC camp this past summer because I am not playing soccer now in college but rather I am running. I was trying to build a better base with more strength focused training and then work on speed once I got to school and got into season and practices. Coach Braz knew I would benefit more working with more distance oriented drills rather than the speed drills over the summer with the camp. GTD: What did you expect from the program? Was it what you expected? Connor: I was not really sure what to expect at first. I knew the XC program was going to require longer runs and have longer durations of drill times since XC requires a much longer race than track and field. So in that case I knew I would be getting in a lot more miles over the summer compared to past summers and I got exactly that. The drills were not as fast as the all-sports camps ones were, but rather they paced out over a longer period of time, helping build the base I was hoping to get. GTD: As a college runner this winter, you may have had a summer program from your college coach. How did you and Coach Braz make this work? Connor: I did have a summer program my college coach, Coach Karen Boen, sent me to work off for my summer training. When I received the schedule I brought it to Coach Braz and he really helped me understand what my coach's objectives were for the summer for me and how to go about training based off it. What Coach Braz did for me, and for many others, was he took my college coach's schedule and made it into a day-by-day workout schedule so that the days where I had to do a workout, such as a fartlek or track workout, he would make those days be on days of the GTD camp. Then making my days off from camp be recovery run days, this way I would have others to work out with and coach would be available to watch and monitor my workout. GTD: The last phase of each training session this summer was devoted to core work, flexibility, and strength. Tell us about it. What did you like and didn't like. Did feelings about this phase change over the length of the program? Connor: I loved ending camp days with all that. Core work is something I feel always needs to be incorporated into training and it helps build a stronger runner and athlete. The hurdle walk-overs was something that Coach Braz introduced to us during the high school season, I thought they were a big help in becoming more flexible, and keeping the hips and legs loose. The medicine ball work was something I found very helpful too, I liked the fact that upper body strength was being incorporated into the ends of the days. These feelings remained the same throughout the time. GTD: What was the most important thing you learned from the summer program? Connor: I've learned, not just from this past summer but from the past 5 now that I've been working with Coach Braz and the GTD camp, that there is always an area of which any athlete can improve upon and to never be afraid to reach outside that comfort zone to work on it. There have been many times in my training that I felt like I wouldn't be able to do something or hit a certain time, but I learned that by trusting the system and going outside that comfort zone great things can and will happen. GTD: Tell us about your college athletic plans. 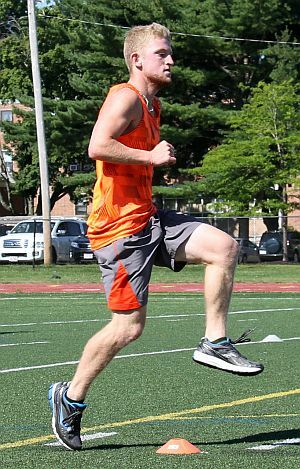 Connor: I am currently running track for Stonehill College, a Division II program. We compete in the Northeast-10 conference. My plans for events right now are undetermined, but I am currently training as a "long sprinter." So it looks like I'll be focusing in on the 800m for my main event but also running more speed events such as the 600m, 500m, and 400m. GTD: Have you decided on an academic focus (major)? Connor: Right now I am a business major with a focus in marketing.